IIeX North America—the premier event for the market research industry—is only one week away and this year we’re delving deep into the future of ResearchTech. 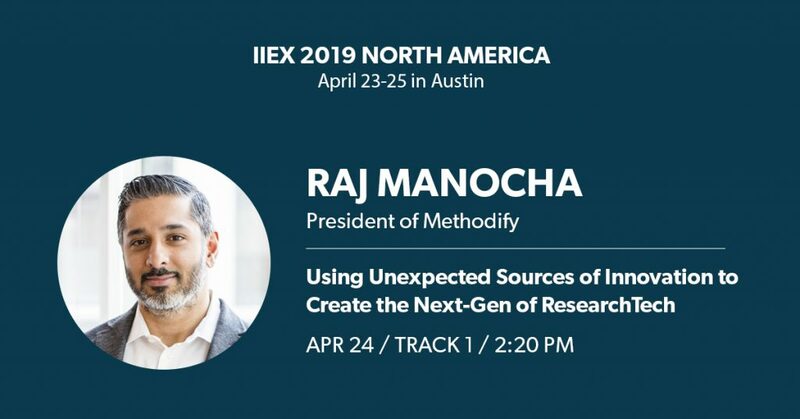 President of Methodify, Raj Manocha, will be uncovering some unusual sources of innovation that are fuelling the next generation of ResearchTech in his talk at IIeX. And if you pop by our booth 12A at any time throughout the conference, you’ll have the chance to film your own thoughts on the state of the market research industry and the future of insights, right inside our very own mTV studio. That’s Methodify TV, if you didn’t catch that. We’re looking forward to seeing many of you in Austin and celebrating the future of insights! We'd love to hear about your projects. Give us a call at 416-364-1455, or email us and let's start talking. Follow us across our social networks.